Exciting times! GPS-tagging has started to provide a wealth of new information on Barn Owl foraging behaviour at levels of detail never seen before. However, the technology used still faces a fundamental problem. Barn Owls are primarily nocturnal, therefore tag batteries cannot recharge themselves using solar energy (as they can on vultures or cuckoos). This means that either; the batteries required are bigger so the tags are heavier than those that could be used on diurnal birds of similar weight, or; tag life is quite severely restricted. Whilst the latest tags do have the potential to significantly increase our understanding of Barn Owl dispersal, ranging, and foraging behaviour, due to the limitations of battery life, significantly large studies are very expensive. However, tag technology and battery technology are advancing very quickly. The maximum weight for a Barn Owl back-pack tag is <3% of body weight. For a Western Barn Owl Tyto alba alba this equates to 10 grams, ideally 9. The maximum weight for a Barn Owl ankle-mount tag is <1.5% of body weight. This equates to 4.5 grams. 1) Tags that just collect ‘fixes’ (position data), sometimes called ‘store-on-board’ or ‘data logging’ tags such as ‘GiPSy 5’. These have to be retrieved in order for the data to be downloaded. In the case of Barn Owls, this is a huge disadvantage due to the fact that their home ranges are huge (c. 5.000Ha), they use a variety of roost sites and at many of these capture will be impractical. Data-logging tags are worth trying on older birds that are known to be extremely site-faithful (e.g. when they are nesting) but are not worthwhile for dispersal studies. They were used on Barn Owls for the first time by Birdwatch Ireland in summer 2016. The tags were programmed to take a fix every five or every ten seconds from 22:00 to 05:00 and designed to fall off the birds after about 10 days. GPS-tagging was undertaken as part of a study by BirdWatch Ireland to assess Barn Owl interactions with major roads including their use of motorway edge habitats for foraging, which is funded by Transport Infrastructure Ireland. Barn Owls were fitted with tags under licence to the National Parks and Wildlife Service and the British Trust of Ornithology, GPS dataloggers (Gipsy-5) were provided by TechnoSmart. 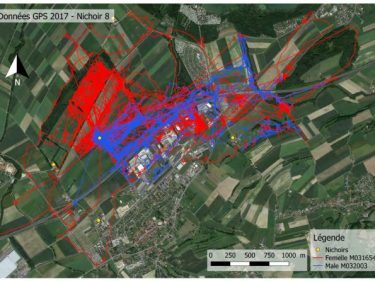 In 2018, a team at the Universite de Lausanne (Switzerland) under Prof. Alexander Roulin, who had previously used GiPSy-5 tags, switched to using Axy-Trek tags that combine a GPS with an accelerometer. Each tag was programmed to record its location every 10 seconds from 30 minutes before dusk to 30 minutes after dawn, and record acceleration at 50Hz with a resolution of 10 bit and a recording range of +-16g. This enabled researchers to determine when (and where) the birds were dropping to the ground whilst hunting. Thank you to Prof. Alexander Roulin for providing details. 2) GPS/ VHF tags such as ‘PinPoint VHF’. 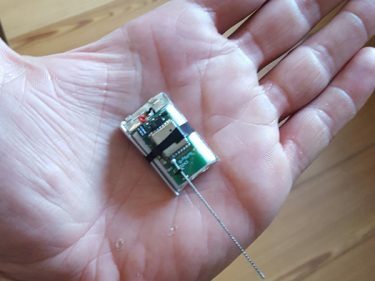 These are GPS tags that transmit a conventional radio signal (called a ‘beacon’) thus allowing the bird to be searched for using a hand-held aerial and receiver. Once found, stored data can be downloaded remotely within a range of 0.5 to 1km. Tags can be scheduled to take fixes and transmit beacon signals during predetermined periods at specified intervals. New schedules can be uploaded remotely, if required. However, data transmission and beacon signals require energy, reducing the number of fixes to about 250 for a Barn Owl tag (based on the beacon and download being on for 12hrs a day). Thus, GPS/VHF tags are only suited to studying local movements and there is a chance that the tag might be retrieved, re-charged, and re-used. 3) GPS/Satellite tags such as ‘PinPoint Argos’. These programmable tags transmit data to global satellites and are therefore well suited to tracking birds in dispersal. In theory, once the bird has stopped dispersing, re-capture could be attempted and the tag re-used. However, it is much more likely that the battery would expire before the bird became sedentary and its precise position was known. However, this depends on how the fixes are scheduled. A tag taking 1 fix a week, which might be deemed adequate for dispersal movements, could last a year. However, finding the owl once it settled (or died) would still be difficult because there’s no VHF beacon on these tags and the GPS locations would only be snapshots of the bird’s location at particular time/dates. The energy used to transmit data means that battery life is again limited to about 50 fixes which is not much information when one considers that the tags and data collection via Argos satellites cost about £1,500 each and the tagged birds are burdened for life. 4) Reverse GPS. Developed at Tel-Aviv University and Movement Ecology Lab at Hebrew University, Reverse GPS is not actually GPS tracking as the tags do not gather any data, nor are they tracked by satellites. The way it works, is that each tag transmits a unique signal which is picked up by two or more ground stations that use time-of-arrival to estimate the locations. The differences in the signal time-of-arrival are so minute that they can only be detected if the station clocks are perfectly synchronised – this is where GPS comes in. The project, named ‘ATLAS‘, uses harness-mounted tags on adult and nestling Barn Owls, as seen in this video, which transmit a unique identifiable signal every two seconds that can also be conventionally tracked. The data gathered can provide a lot of movement detail with a similar degree of accuracy as GPS-derived locations. However, the area covered is limited by the proximity of ground stations so long-distance dispersal movements may be under-recorded. Thank you to Dr Motti Charter for providing details. There are two reputable telemetry companies making small GPS tags in the UK: Biotrack and Pathtrack. Elsewhere in the world there’s Lotek (in Canada) and Sirtrack (in New Zealand) – both are partners of Biotrack, so the tags are the same. In Italy, a company called Technosmart produces the ‘Gipsy 5’ tags used by Birdwatch Ireland and the Axy-Trek tags used by the Universite de Lausanne. In the US there are several other telemetry companies but none of them come close in this particular technology. This photo gallery shows three methods used for attaching conventional radio tags to Barn Owls. Tags that are attached to feathers and tags that are glued directly to the skin (not shown) usually become unattached (and often lost) within a week or two and are only used for short-term tagging. The two long-duration ways of tagging Barn Owls (whether conventional radio tags or GPS tags) are the ‘back pack’ or ‘harness’ method and the ankle-mount method which is normally only used on fully-fledged birds.